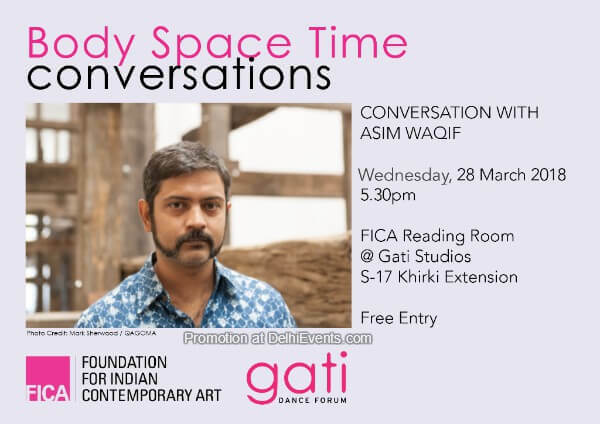 Event Description : The Foundation for Indian Contemporary Art and Gati Dance Forum invite you to a conversation with artist Asim Waqif as part of the Body Space Time Conversation Series. The Foundation for Indian Contemporary Art, in collaboration with Gati Dance Forum, features artist Asim Waqif as part of the Body Space Time Conversations series, which is designed to invite a range of practitioners into the studio and engage them in a discussion about performance and its intersection with other disciplines. The series is part of BODY SPACE TIME, an ongoing 4-month certificate course in dance technique and choreography, running from Jan - May 2018 at Gati Dance Forum. It populates a context for the participants of the Body Space Time course, allowing them to engage with creative processes through their own practice and a wider dialogue. It also creates a space for practitioners to share their practice with the larger public, triggering a critical discourse that links various methodologies and forms. This week, we look forward to an evening with artist Asim Waqif, following his current exhibition of new works, entitled Residual Fear at Nature Morte. Through his art, Waqif explores questions of ecology and anthropology, this exhibition in particular exploring systemic violence through the lens of built environments and objecthood. Asim Waqif (born 1978, Hyderabad) studied architecture at the School of Planning and Architecture, Delhi. After initially working as an art director for film and television, he later started making independent video and documentaries before moving into a dedicated art practice. His recent projects have attempted to crossover between architecture, art and design, with a strong contextual reference to contemporary urban planning (or the lack thereof) and the politics of occupying, intervening in, and using public spaces. The Foundation for Indian Contemporary Art is a non-profit organization that aims to broaden the audience for contemporary Indian art, enhance opportunities for artists, and establish a continuous dialogue between the arts and the public through education and active participation in public art projects and funding. The Gati Dance Forum is a pioneering arts initiative that works in the field of contemporary dance. Founded in 2007, Gati has consistently searched for avenues to create a sustainable environment for the development of contemporary dance practice in the country through a body of pioneering and innovative projects that attempt to address areas as diverse as pedagogy, creation, research, outreach and arts advocacy and policy.